A mid-infrared image of M91 as seen by the Spitzer Space Telescope. M91 is the prototype example of a barred spiral galaxy. 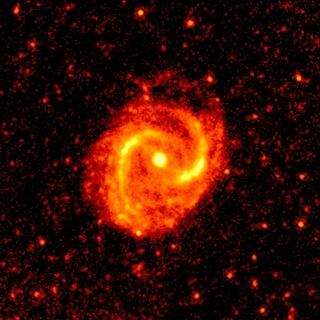 Although the spiral arms are easily seen in mid-infrared light, the bar is only faintly visible. A catalog of detailed infrared portraits of more than 200 galaxies will be released publicly for the first time later this year, giving people access to exciting views of the cosmos. The pictures were made from data collected by NASA's Spitzer Space Telescope, which is designed to study objects in the universe in infrared light. Some of the images that will be included in the new directory will be unveiled at the U.K.-Germany National Astronomy Meeting, which is being held this week in Manchester, England. George Bendo, an astronomer at the Jodrell Bank Center for Astrophysics, will present the images at the meeting, where 900 astronomers and space scientists are gathering at the Unviersity of Manchester. "These data show the intimate connection between the interstellar dust in galaxies, here seen shining in infrared light, and the formation of stars on a grand scale," Bendo said in a statement. "Now anyone with Internet access can download these extraordinary pictures for themselves and take a look at some of the objects being studied by the world's leading astronomers, as part of their effort to better understand the universe we live in." NGC 4772 contains a dust ring that is bright in mid-infrared light. Dust rings like this are common in many spiral galaxies. Several galaxies, including M60, M61, M88 and M91, are located between 47 million and 63 million light-years away in the large cluster of galaxies in the direction of the constellation of Virgo. The mid-infrared light from these galaxies mostly traces interstellar dust heated by hot, young stars found in regions of dynamic star formation. The image of M91 shows a prototype example of a spiral galaxy with a central bar. Although the spiral arms are easily seen in mid-infrared light, the bar is only faintly visible. Still, the images presented by Bendo at the astronomy meeting represent only a small sample of those that will be released later in the year. "The 24-160 micron Spitzer images need expert processing to be suitable for scientists, let alone the general public and until now many of them had been overlooked," Bendo said. "I volunteered to do this work for these galaxies as they will soon be observed by the Herschel Space Observatory at far-infrared wavelengths. With processed Spitzer data, astronomers will be able to make a direct comparison between the views from each telescope."